Brocanteur /bʁɔ.kɑ̃.tœʁ/: A person buying and selling antiques and gewgaws, history and nostalgia. A travelling brocanteur sells his or her stuff at local outdoor markets called brocantes. Very popular in France. Villefranche-sur-Mer, the French Riviera, a Sunday morning: Jacqueline Morbelli has finished unloading her car next to her regular three square metres at the brocante in this Mediterranean town – same procedure as every Sunday. With her big smile, enhanced by bright lipstick, and her fantasy hats, she’s the queen bee of the market: The one the locals, the tourists, the collectors and the kitsch lovers swarm to, attracted by her Art Deco items, American Vintage jewelry, silver and silk, hatpins and royal china. A tall bespectacled gentleman with a mustache of steel strides across the square. Jacqueline immediately pulls out a box of pens. He takes out his magnifying glass and focuses on a chiseled silver pen. “On a mission again?” The lipstick smile is even bigger. She takes the phone from him, and there are numbers and laughs back and forth before they settle for 200 euros. The pen will join new pals in a pen lover’s collection. A cheerful goodbye – mission accomplished. 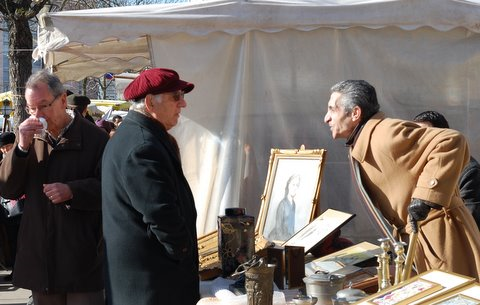 Collectors are an important source of income for les brocanteurs. Jacqueline specializes in pens, while others might go for old posters, books, religious items or miniature perfumes. Jacqueline sells history, through old venerable pieces and less venerable doodahs. “Antiques light”, somewhere between flea markets and prestigious antiques dealers. Fleas are no good for the picky Riviera clientele. She gets her goods from auctions, fairs, estates of a deceased persons and exchanges with colleagues – a brocanteur’s treasure hunt. It’s a full time job and it’s for life – it’s in her blood. It’s almost 10 o’clock and time for a morning coffee or a friendly glass of rosé with colleagues, a holy ritual. There’s Jacqueline and her son David, who has a stand a few metres away. And there’s the guy with the nonchalant red scarf and matching nose, looking like he belongs in a bygone era, just like the items he sells. The waiter knows their names and what each one is having. Yet reading the espresso grounds, you can see something fake about this community. The brocanteurs are competitors and often individualists with strong personalities. But this jovial get-together, the shouting over parasols, the colours and the noisy atmosphere still constitutes the magic of the market, and an advantage when competing with regular shops and Internet shopping. Porte de Vanves, Paris. A stop on the busy metro 13 and brocante-historical ground. This was a trading post long before the metro and before the area became a part of inner Paris. The 19th century brocanteurs sold fleas and trash and were called the “rag people”, often beggars and minorities who were persecuted by the established, catholic France. They were not to be seen, their trade was offensive, even repulsive. The rich preferred to throw or give things away. Today, people come from all over to the weekend market, and Avenue Marc Sangnier and Avenue Georges Lafenestre are filled with about 400 brocanteurs. There’s a buzz of Japanese on metro 13. A horde of young people gets out and up into a different Paris. They point loudly at the brown signs showing the way to the Marché aux Puces, the flea market, and join the Babelish line of curious visitors. The line passes headless dolls and posters from the revolutionary spring of 1968, expensive coins and silver chandeliers. The sound of a guitar sneaks in. Some brocanteurs play poker while bickering gently, others take a nap in the sun. “Is this from Lyon or Paris?” A boat glides silently under a bridge in a painting. It’s become harder to make a living being a brocanteur. Some will blame the euro; people are just looking and not buying. Others will blame Internet shopping. For some, the passion seems to be gone, it’s just too difficult. And passion is a prerequisite in this line of business. But then it’s still there after all, in the story of each item on the table, or when it’s difficult to let an item go. It’s a long way from the real fleas of yore to the renowned ones today, and a long way from the rag people to Jacqueline’s hats. She was there when the brocantes really became popular in the 1980’s, and she’s seen the markets multiply and become more professional. Each week there are hundreds of markets in France, organized by the communes. This professionalization has led to more and stricter laws and rules. Jacqueline has the authorizations she needs, such as a license to be a travelling merchant, and she has registered in all the necessary registers, such as the French company register. For every market day, local authorities demand that she keeps an exact inventory of all the things she has bought or traded, to keep control with stolen items. If she doesn’t, she risks six months in jail and a 30 000 euros fine. Education is another result of the professionalization. Traditionally, future brocanteurs are apprentices, often within the family, like when Jacqueline taught her son David. Today, the University of Paris Est offers an education for antique dealers and brocanteurs, and the courses are as varied as the items they will be selling: Art history, the sociology of art markets, communication, restoration techniques, price evaluation and negotiation, tax law and accounting. Porte de Vanves. Lunch is over and baguettes and wine in paper cups are removed from more or less antique tables. Some skip lunch because they have more of a hunger to sell, often the youngest. Two of the Japanese girls from the metro admire old jewelry. 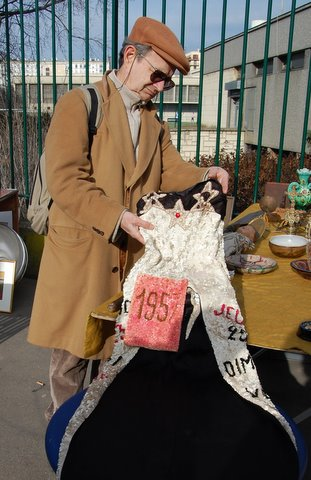 “The price is this… Brocanteur Loïc writes the number 87 on a piece of paper. “…but could be this.” 70 on paper. «Yes, yes! « One of the girls smiles and nods, inspects the necklace and nods again. «And this – 30.» No bargaining for the ring, but the other girl smiles and nods just as eagerly all the same. «Merci, merci.» They pay and are ever so grateful. Loïc looks pleased. His career as a brocanteur has lasted for two years, and he tries to make a living from it, doing it only on weekends. Again, the passion helps, for him it’s about beauty and about jewelry being close to the body. Villefranche-sur-Mer, around 17.00. Jacqueline puts her things back in the car. Next Sunday she’ll be back, and in the meantime there will be other markets, other people, and a new treasure hunt. She needs to have something for every taste. From the rich and demanding Riviera to the more down to earth north, going to brocantes is a hobby for many a Frenchman. So much so that they turned it into a verb – brocanter. This hobby trend, together with collector trends and recycling trends, can perhaps secure the future of the trade. 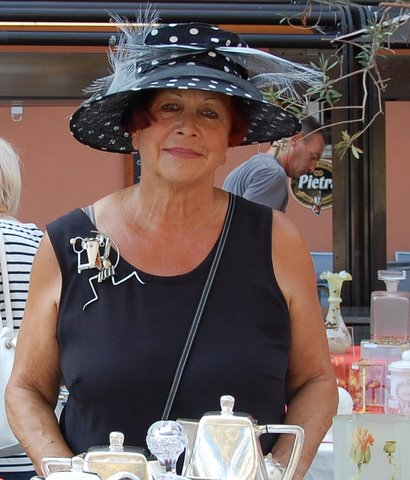 As well as the savoir-faire and savoir-vivre of the brocanteurs, their competence, people knowledge and passion, personified by Jacqueline and her hat extravaganza. With a generous gesture, embracing her son David, the man with the red scarf, the knick-knacks and the parasols – she declares that it’s more than a passion, it’s a high. That this is what she lives for. The magic of the market.